Conduct a biomechanical evaluation of stingers for insight to design a painless and mechanically durable micro syringe-needle system for biomedical applications. How cool is that? And because I’d been on the receiving end of a wasp’s stinger a dozen or more times over the years, I was also intrigued by the detailed figures and assessment of how they (the wasps) had accomplished that task. I thought you might be, too. - 3D micro-computed tomography to assess stinger structure. Micro-computed tomography, like CAT scans, uses x-rays to image cross-sections of an object to produce a virtual model of the object non-destructively. - Nanoindentation to determine their mechanical properties. Nanoindentation enables the measurement of properties, such as elastic modulus and hardness, at submicroscopic scales. The elastic modulus is the resistance to being deformed elastically when a stress is applied; hardness is the resistance to plastic deformation. - Numerical modeling to assess the mechanical behavior during stinger penetration. The researchers obtained the 3D-structures, geometry with approximate dimensions, and functioning mechanism of both wasp and honeybee stingers. Both insects’ stingers can be sectioned in length into three regions--basal, medial and apical; both are composed of paired lancets that slide back and forth for penetration, one stylet and a tip. The lancets and stylet have hollow shafts to deliver venom through the orifice, and their diameter decreases from base to tip. That gradient geometry improves mechanical stability and durability. 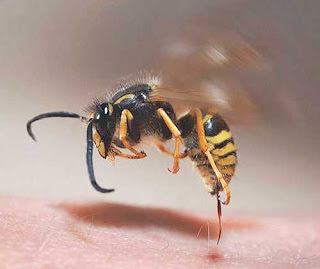 The wasp stinger is on the order of 2.67 millimeters (about 0.1 inch) long; the honeybee stinger is shorter, on the order of 1.62 mm (about 0.06 in). The wasp stinger has curvature and a reinforcement rib at its medial region; the honeybee stinger has neither. The reinforcement rib improves buckling resistance during penetration. The honeybee stinger has reverse-facing barbs that make an angle of 9 degrees with the stinger shaft, facilitating penetration. The barbs stick into the victim’s skin after insertion. 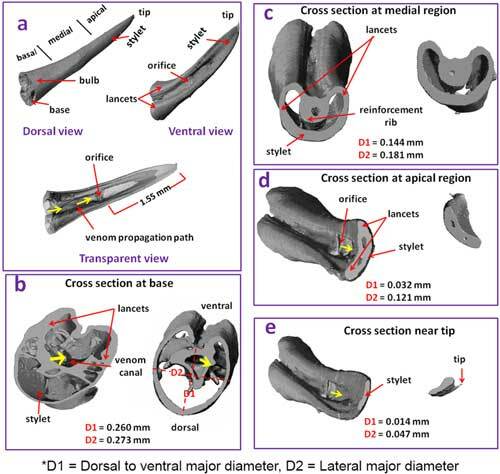 Nanoindentation measurements along the stingers’ dorsal surface found the elastic modulus and hardness of wasp and honeybee stingers have negative gradients from base to tip, with no distinguishable gradient in the transverse direction. Elastic modulus and hardness along length of honeybee stinger (from www.nature.com/articles/s41598-018-33386-y). The numerical modeling, based on the tomographic images and nanoindentation measurements, show the stress and strain distribution of wasp and honeybee stingers for penetration are optimum at angles of about +10° and -6°, respectively. The insects would adopt these angles to sting. The researchers drew upon the gradient geometry and mechanical properties, as well as the insertion angle and sliding mechanism of paired lancets with the venom pumping mechanism to design a micro syringe-needle device. 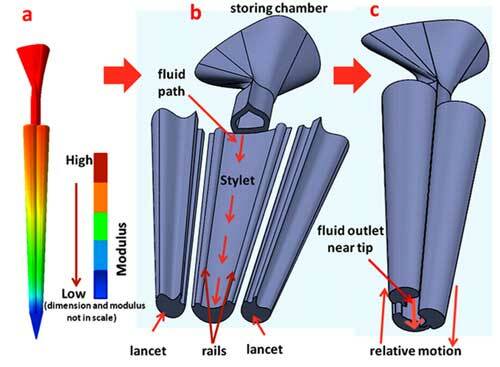 (a) Proposed design of micro syringe needle system, (b) Enlarged view of internal structure (tip removed), (c) Sliding motion of lancets to generate an outlet near tip in enlarged view (from www.nature.com/articles/s41598-018-33386-y). The micro needle should have a decreasing diameter from base to the tip and be made of materials that have gradient mechanical properties, minimum at the tip (i.e., softest) and maximum at the base. A geometry similar to that of the stingers (primarily the wasp stinger’s curvature at the medial region) will give minimum stress if inserted in a specific angle and should improve the mechanical durability and performance. The study demonstrated that insights gained through detailed analysis of the structural features, gradient geometry, mechanical properties and mechanical performance of wasp and honeybee stingers can be used to design a micro syringe-needle or other bioinspired devices. I repeat, how cool is that? Thanks for stopping by. I hope it was of interest to you.